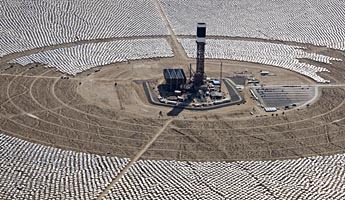 In the Mojave Desert near Las Vegas, several companies including Google are finishing the Ivanpah Solar Project, a solar thermal electric generating facility. The facility’s 300,000 mirrors focus sunlight on three towers, where water is heated to steam. The $2.2 billion project will generate 377 MW of electricity, nearly doubling the amount of solar thermal electricity produced in the United States.